Santa Claus - a jolly figure in red that causes as much or more arguments and strife among adults as he causes joy among children. But every year, kids write letters to Santa Claus and set out milk and cookies for him to consume at his visit. Parents take their kids to visit local Santa Claus figures (we call them Santa's brothers), so the kids can personally tell Santa what they want. Some people even participate in "The Elf on the Shelf" game. 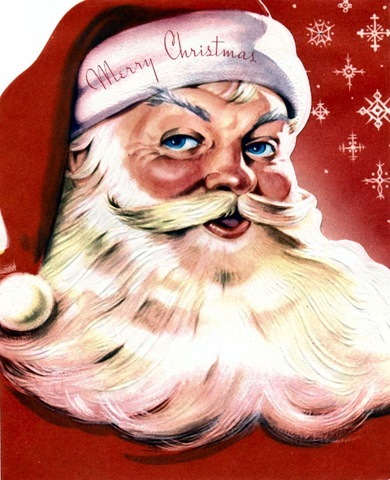 The conflict for adults comes to what to tell the kids about Santa Claus. On one hand, it is so much fun to pretend he exists. Both my husband and I get almost as excited as the kids when Christmas rolls around. We talk about how current weather might effect Santa's sleigh. We bake cookies, and sometimes leave out carrots for the reindeer since they are pulling around a sleigh filled with presents for every child in the world. My husband and I take turns hiding the elves, named Rosina and Laurenthian, so the kids can spend time looking for them every morning in December. On the other hand, some people feel as though they are lying to their kids when they act like Santa Claus is real. Other people feel that Santa Claus and the hoopla around him take away from the spirit of season. I used to belong to the group that feels uncomfortable telling kids about Santa. I wondered if my kids would think I lied to them, and decide not to trust me anymore. Or that my kids would be the laughing stock of the school as they believed in Santa Claus long after their friends. Or that simply believing in Santa made me a bad parent. Then I realized that Santa Claus is pretend play, just like pretending the cars talk to them or pretending that their stuffed animals were alive. Santa Claus is a time for the entire world to make believe and have fun, to learn how to give presents without getting instant recognition for our efforts (at least from young kids). As for my concerns? My kids trust me, perhaps even more, since I still play pretend with them. While both kids are more than old enough to know that Santa is fictitious, but they both love pretending as much as we do. Neither kid gets teased at school, and sometimes they run into a fellow student who wishes his/her family still celebrated Santa Claus. So I hope you think about what you tell your kids, and I hope play pretend with them this time of year. From my experience, it makes everyone a bit happier in the end. We just tell our kids from the get-go that there is no Santa, but we also swore them not to tell their friends because there are parents who enjoy perpetuating the myth of Santa. Yeah, some years I had a problem with Fat Red Git getting all the credit. But since the kids know who Santa is, we still get the credit while getting to play Santa Claus. If I have to play somebody imaginary though, I'd rather play Red Sonja. Tons better looking. Heh.